Last Thursday my husband and I went for a walk to the Pont des Arts so as to enjoy the very special atmosphere of this pedestrian bridge at night and to take pictures of the amazing views on Paris one can admire from there. The walk from the Rue Lacépède took about twenty five minutes through the Quartier latin. We had dinner in a good and very welcoming Italian restaurant just before arriving to the Ponts des Arts in the rue Mazarine, Amore & Gelosia: the Calamari fritti were excellent ; the pasta were good too and generously served ; and the waitresses were smiling and thoughtful! We left the restaurant at night and kept walking towards the Seine. 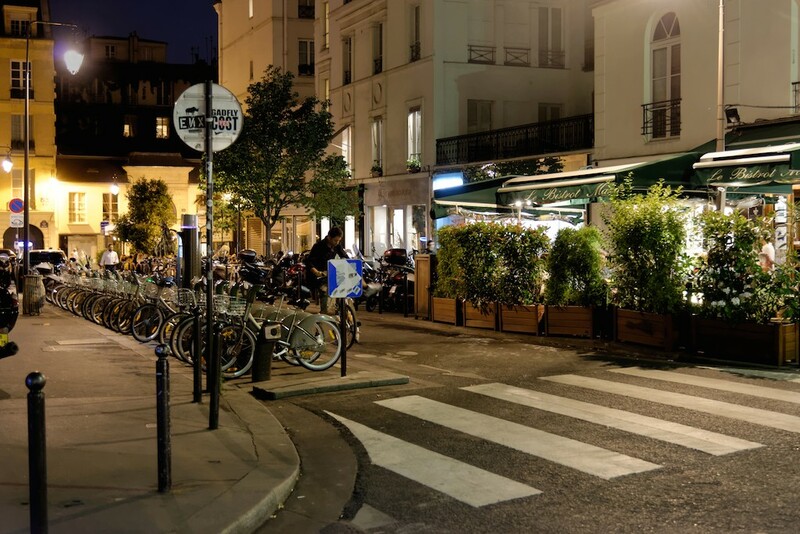 A few meters further in the rue Mazarine we noticed another restaurant with a pleasant outdoor terrace which could have been another nice place where to have dinner: it is called the Bistro Mazarin and is located at the corner of rue Mazarine and rue Jacques Callot. We have not tasted the food but it seems to be a traditional French Bistro and the terrace looks really great!